If you are looking for an escape from the family this Christmas then head over to Gala Casino where you can enjoy 20 free spins on a selection of fantastic slots. All you have to do is make a deposit of at least £20 and opt in to the promotion. You will then receive your free spins which can be used on great games such as Franki Dettori’s Magic 7, Iron Man 3, Spider-Man, Incredible Hulk and Gladiator. 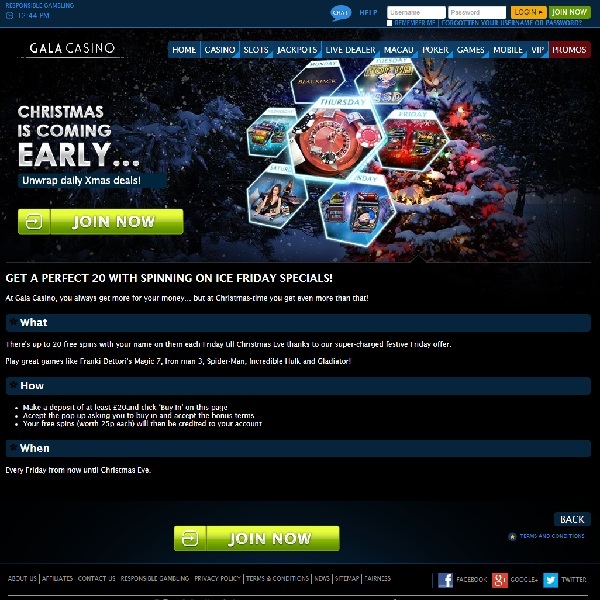 This is just one of the many special Christmas offers available to members of Gala Casino. There is also a £50,000 Cash Giveaway in the live casino, a bonus for playing the slot of the week and many more. Make sure that this is a Christmas to remember, head over to Gala Casino today and you can start enjoying all of these promotions straightaway.